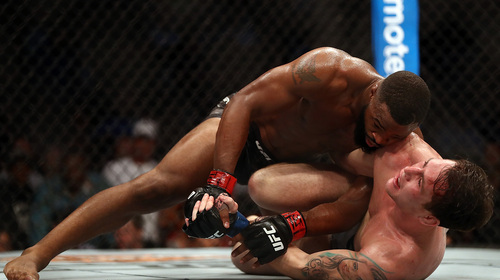 Tyron Woodley vs Darren Till UFC 228 Sep 8, 2018 (22:38) Tyron Woodley vs Darren Till at UFC 228 from September 8, 2018 in Dallas, USA. 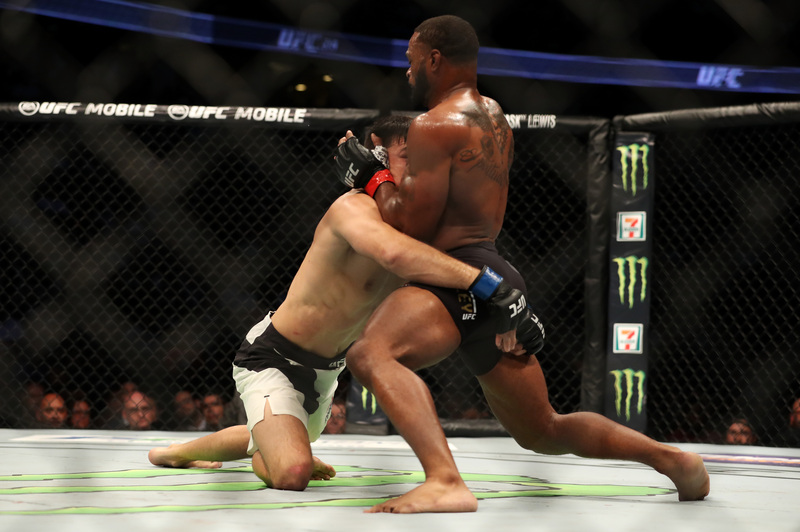 Tyron Woodley vs Demian Maia UFC 214 Jul 29, 2017 (36:58) Tyron Woodley vs Demian Maia UFC 214: Cormier vs Jones 2 from July 29, 2017 in Anaheim, California. 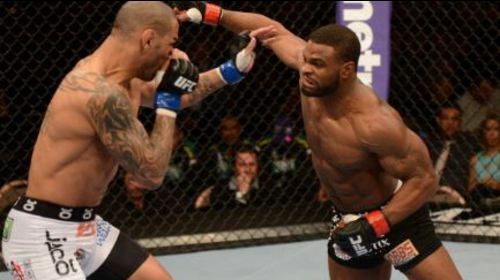 Tyron Woodley vs Stephen Thompson UFC 209 Mar 4, 2017 (41:31) Tyron Woodley vs Stephen Thompson at UFC 209: Woodley vs Thompson 2 from March 4, 2017 in Las Vegas, Nevada, USA. 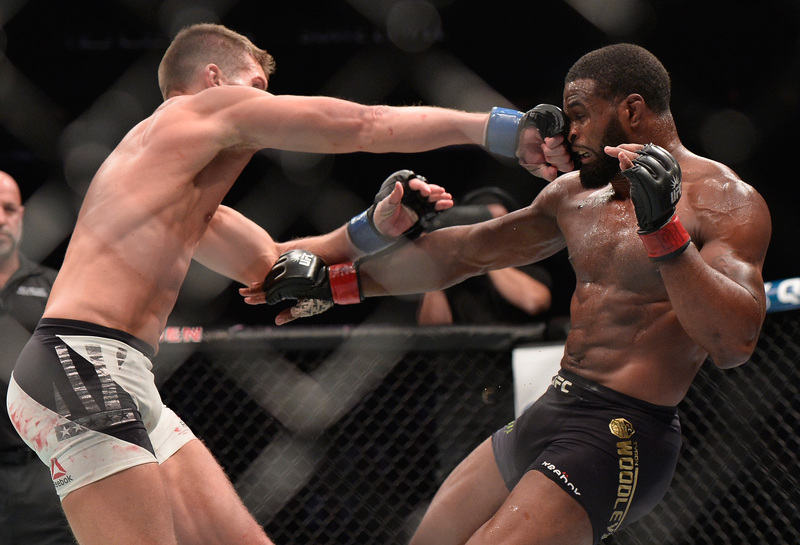 Tyron Woodley vs Stephen Thompson UFC 205 Nov 12, 2016 (49:10) Tyron Woodley vs Stephen Thompson at UFC 205: Alvarez vs McGregor from November 12, 2016 in New York, USA. 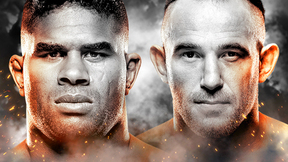 Tyron Woodley vs Robbie Lawler UFC 201 Jul 30, 2016 (20:57) Tyron Woodley vs Robbie Lawler at UFC 201: Lawler vs Woodley from July 30, 2016 in Atlanta, Georgia, USA. 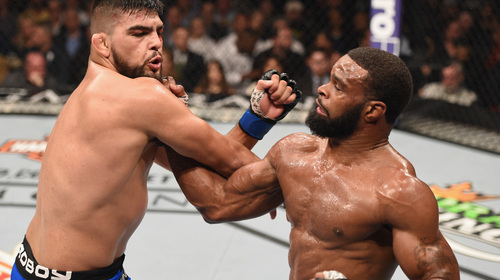 Tyron Woodley vs Kelvin Gastelum UFC 183 Jan 31, 2015 (29:19) Tyron Woodley looked to keep his top contender status as Kelvin Gastelum looked to keep pushing his way to the top of the welterweight division. 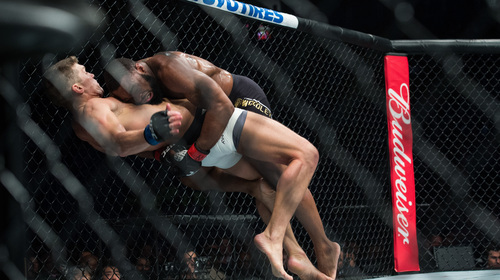 Rory MacDonald vs Tyron Woodley UFC 174 Jun 14, 2014 (29:21) The road to the welterweight title ran through Vancouver, as Canada's own Rory MacDonald faced Tyron Woodley in a clash of elite 170-pound contenders. 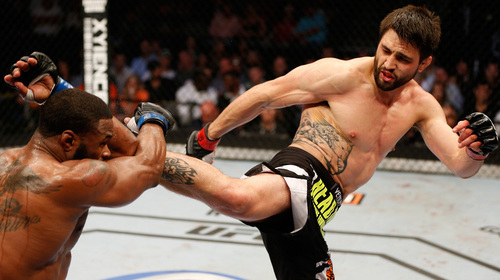 Tyron Woodley vs Carlos Condit UFC 171 Mar 15, 2014 (22:00) Former interim titleholder “The Natural Born Killer” Carlos Condit continued his quest for another shot at championship glory when he squared off against hard-hitting Tyron “The Chosen One” Woodley. 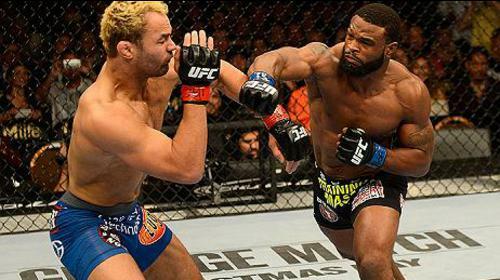 Tyron Woodley vs Josh Koscheck UFC 167 Nov 16, 2013 (14:15) Tyron Woodley looked to bounce back from his decision loss against Jake Shields at UFC 161. 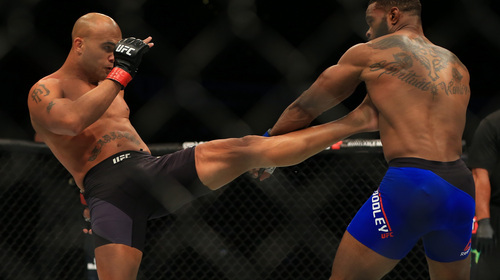 Meanwhile, former title contender Josh Koscheck suffered a first round KO loss in his last bout and was seeking redemption against Woodley. 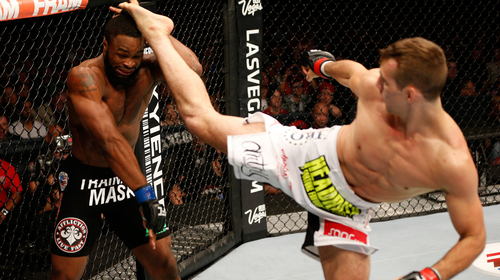 Jake Shields vs Tyron Woodley UFC 161 Jun 15, 2013 (24:26) In his UFC debut, Tyron Woodley knocked out his opponent in 36 seconds, and a victory over Jake Shields would send him even further up the welterweight ranks. Meanwhile, Sheilds was returning to the UFC after nearly a year on the sidelines and was hungry for a win. 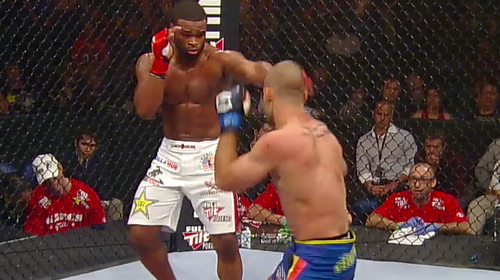 Tyron Woodley vs Jay Hieron UFC 156 Feb 2, 2013 (9:01) Coming off a Strikeforce title loss to Nate Marquardt, Tyron Woodley entered the Octagon for the first time at UFC 156 against power wrestler Jay Hieron. 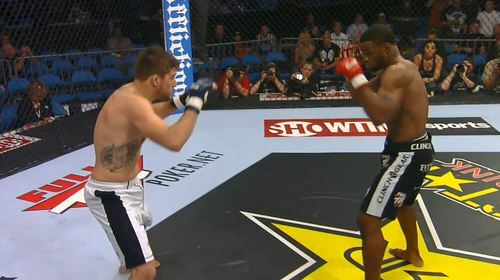 Nate Marquardt vs Tyron Woodley Strikeforce: Rockhold vs Kennedy Jul 14, 2012 (28:39) Nate Marquardt won the Strikeforce welterweight championship in his welterweight debut at Strikeforce: Rockhold vs Kennedy on July 14, 2012. 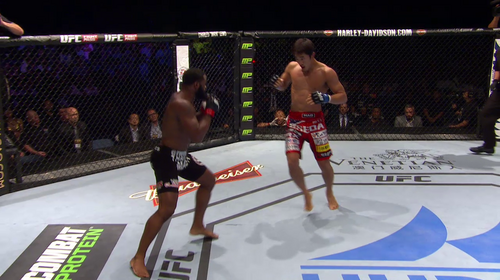 Tyron Woodley vs Jordan Mein Strikeforce: Rockhold vs. Jardine Jan 7, 2012 (27:13) Tyron "The Chosen One" Woodley was on an inferno streak in Strikeforce with 7 straight wins. Up next, the former 2x NCAA D1 All-American wrestler faced Jordan "Young Gun" Mein, who made quite an impression with his 13th KO/TKO win in his Strikeforce debut. 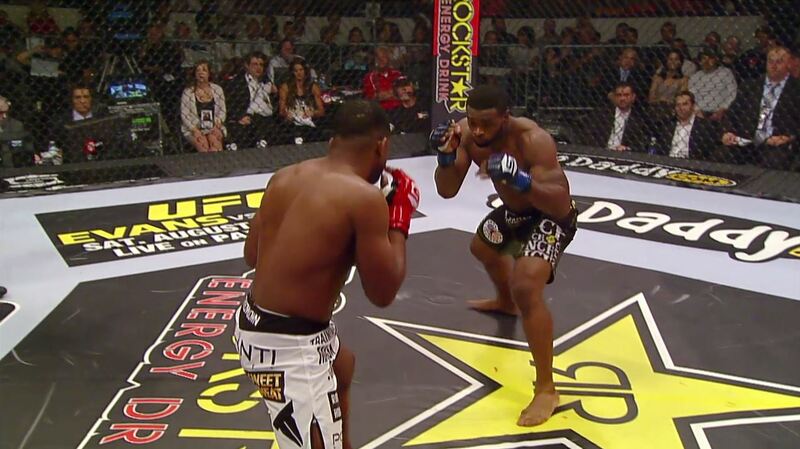 Tyron Woodley vs Paul Daley Strikeforce: Fedor vs. Henderson Jul 30, 2011 (25:49) In a classic "striker vs. grappler" match-up, English knockout artist Paul "Semtex" Daley, who owned 20 career wins via KO/TKO, took to the Strikeforce cage to clash with former 2x NCAA D1 All-American wrestler Tyron Woodley, who carried a perfect 8-0 MMA record. Tyron Woodley vs Tarec Saffiedine Strikeforce Challengers 13: Woodley vs. Saffiedine Jan 7, 2011 (24:28) A former 2x NCAA Division I All-American wrestler turned undefeated MMA fighter, Tyron “The Chosen One” Woodley was aiming for his 6th straight Strikeforce win against Belgian striking specialist Tarec “Sponge” Saffiedine, who was riding three straight wins. Tyron Woodley vs Andre Galvao Strikeforce: Diaz vs Noons II Oct 9, 2010 (6:08) Undefeated in MMA and a 3x winner in the Strikeforce cage, former 2x NCAA D1 All-American wrestler Tyron Woodley was set to tangle with a fellow world-class competitor in highly-decorated BJJ blackbelt Andre Galvao, who was 2-0 in the Strikeforce cage. Tyron Woodley vs Nathan Coy Strikeforce: Challengers 8 May 21, 2010 (26:25) Two former NCAA Division I All-American wrestlers collided as Oregon State University’s Nathan Coy, with his 8-2 pro record and three straight stoppage wins, faced University of Missouri’s undefeated Tyron Woodley, who had won five straight by submission. 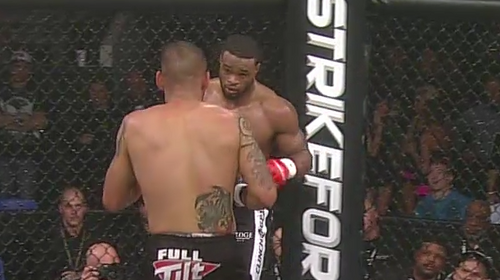 Tyron Woodley vs Rudy Bears Strikeforce Challengers 5: Woodley vs Bears Nov 20, 2009 (16:27) Following back-to-back submission wins in Strikeforce, former NCAA Division I All-American wrestler Tyron Woodley was set to face fellow hot streaker in Strikeforce debutant Rudy “Bad News” Bears, who was riding six straight wins. Tyron Woodley vs Zach Light Strikeforce Challengers 3: Kennedy vs. Cummings Sep 25, 2009 (20:46) Scoring his 3rd straight submission win in his Strikeforce debut, former 2x NCAA Division I All-American wrestler Tyron Woodley aimed to keep his undefeated in MMA streak alive against Wolfslair’s wrestling coach Zach “The Lisbon Outlaw” Light. Tyron Woodley vs Salvador Woods Strikeforce: Lawler vs Shields Jun 6, 2009 (7:20) Tyron Woodley vs Salvador Woods from Strikeforce: Lawler vs Shields on June 6, 2009 in St. Louis, Missouri.